Are you looking for some crafts that can decorate your desk? This item will be an excellent choice. 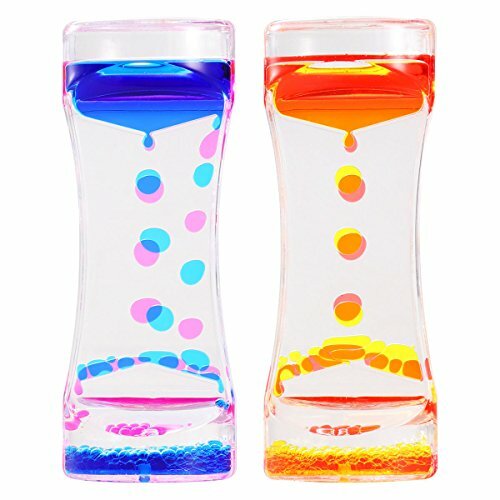 It is an oil hourglass with bubble motion. Each one is designed with two colors mixed. The timer is approx. 1 minute long, but may vary slightly due to handmade work. Such a pretty and practical decoration will deserve your favor. – Color: Blue and rose red, yellow and orange. – Size: Approx. 13.7 x 5.2 x 3.2cm/ 5.39 x 2.05 x 1.26 inch (LxWxH). – The oil can flow from the top to the bottom, and you can flip over it, then start again. – A small and pretty waist and two colors mixed design will be a beautiful decoration. – May be able to cultivate your sentiment.- Captivating liquid bubbling motion will hold anyones attention! – Perfect to decorate your home and office, great as a gift to children and friends. – This oil hourglass doesn’t measure exact time, only can be a decoration.